Laboratorio de Carcinoparasitología, Instituto de Ciencias del Mar y Limnología, Universidad Nacional Autónoma de México. Apartado postal 70305, 04510 México, D. F., México. Few studies have focused on the palaemonid fauna of the Mexican Caribbean. This study provides a list of shallow water freeliving and symbiont shrimps of the family Palaemonidae collected on turtle grass (Thalassia testudinum) in Bahía de la Ascensión, Bahía del Espíritu Santo and Mahahual reef lagoon, Quintana Roo, Mexico. Ten species in 8 genera are reported, of which the genus Periclimenes is the most diverse with 3 species. An updated geographic distribution along the western Atlantic and other regions is provided for all the species. The greatest affinity of the palaemonid fauna studied, besides that with the Caribbean province, is with the Brazilian, Argentinian, and Texan zoogeographic provinces. Of the 10 species reported in this paper, 8 represent new local records in the studied area. Key words: Palaemonidae, Decapoda, Caridea, Mexican Caribbean. Los crustáceos de la familia Palaemonidae del Caribe mexicano han sido poco estudiados. En este trabajo se presenta un listado de palemónidos de vida libre y simbiontes recolectados en el pasto marino Thalassia testudiuim de Bahía de la Ascensión, Bahía del Espíritu Santo y la laguna arrecifal de Mahahual, Quintana Roo, México. Se registran 10 especies pertenecientes a 8 géneros, siendo el género Periclimenes el más diverso con 3 especies. Para todas las especies se proporciona su distribución geográfica en la costa del Atlántico americano así como en otras regiones. Además de la provincia Caribeña, los palemónidos recolectados también muestran alta afinidad con otras provincias zoogeográficas como la Brasileña, Argentina y Texana; de las 10 especies registradas en este estudio, 8 representan nuevo registro local en el área estudiada. Palabras clave: Palaemonidae, Decapoda, Caridea, Caribe mexicano. Among decapod crustaceans, shrimp have been extensively studied, both the economically important penaeids (Chace, 1972) as well as the carideans, represented by a considerable number of species in tropical and subtropical waters of the world (Wicksten and Hendrickx, 2003). Caridean shrimps of the family Palaemonidae are common in intertidal and shallow subtidal habitats (Wicksten, 1989) to 1 285 m depth (Chace and Bruce, 1993), and are adapted to different environments including marine, brackish and freshwater habitats. Most species are freeliving, although some species are commensals of other invertebrates (Holthuis, 1951; Wicksten, 2005), whereas others are cleaners of marine fish (Limbaugh et al., 1961). Often, palaemonid shrimps are small, but others of larger size have economic interest as human food, i. e., the genus Macrobrachium. Few studies have presented information on the Palaemonidae of the coast of Quintana Roo, on the Caribbean coast of Mexico. Some are checklists of specific areas and different kinds of marine habitats (BrionesFourzán and LozanoÁlvarez, 2002). Chace (1972) is one of the important references for this group of crustaceans, since it offers identification keys and descriptions of new species. Other important contributions to the carcinological fauna in the area is that by Markham and DonathHernández (1990), Markham et al. (1990) and BrionesFourzán and LozanoÁlvarez (2002) who published lists of the shallow water decapods including the palaemonids, and provided new records for the area. Complementarily, the deep water caridean shrimps have been studied by EscobarBriones and VillalobosHiriart (2003). Recently MartínezMayén and RománContreras (2006) described a new species of Periclimenes Costa, 1844, from Bahía de la Ascensión, and stressed the need to generate more studies for this group of crustaceans in this region. Therefore the objective of this study is to provide a list of the Palaemonidae collected in the seagrass beds of Thalassia testudinum Banks ex Köning, along the southern coast of the state of Quintana Roo in the Mexican Caribbean. Diurnal sampling took place at different stations of Bahía de la Ascensión (19°30'19°50' N, 87°25'87°50' W), Bahía del Espíritu Santo (19°12'19°25' N, 87°41' W), and Mahahual reef lagoon (18°42.88' N, 87°42.44' W), along the central southern coasts of Quintana Roo, Mexico (Fig. 1). Specimens were collected with a ColmanSeagrove sledge net with a mesh of 800 µm in T. testudinum meadows at depths between 0.41.5 m. The crustaceans were fixed with 10% formaldehyde immediately after sampling and were later preserved in 70% ethanol. Substrate sampled included sandymud and sandyrock in both bays, and sand in the Mahahual reef lagoon. Data on diverse aspects (currents, temperature, salinity, sediment type, vegetation) of the study area can be found in MerinoIbarra (1986), JordánDahlgren et al. (1994), CastellanosOsorio and SuárezMorales (1997) and SuárezMorales and Rivera (1998). The list of species included here follows the arrangement proposed by Martin and Davies (2001) and entries are ordered alphabetically. Synonymy, typelocality, material examined, habitat, previous Mexican Caribbean records, and geographic range are cited for each species. The number of individuals and collection date for each locality are also reported. Synonymies are based in the original descriptions, monographs, and specialized literature. The geographic distribution of the species in the American provinces follows Boschi (2000). All specimens are deposited in the collection at the authors' laboratory, in the Universidad Nacional Autónoma de México (UNAM). A total of 13 914 palaemonid shrimps in 10 species and 8 genera, were determined. The genus Periclimenes was the most diverse with 3 species. Eight species presented new local records in the studied area (Table 1). Cuapetes americanus (Kingsley, 1878) comb. nov.
Anchistia Americana Kingsley, 1878: 96. Periclimenes (Harpilius) americanus: Holthuis, 1951: 60 (complete synonymy), pl. 18, figs. aj, pl. 19, figs. ae.Ledoyer, 1986: 162, fig. 11.Nizinski, 2003: 104. Periclimenes americanus: Coelho and Ramos, 1972: 147.Chace, 1972: 31.Felder and Chaney, 1979: 24.Markham and McDermott, 1980: 1269.Williams, 1984: 83, fig. 56.Markham et al., 1990: 419.HernándezAguilera et al., 1996: 26.CamposVázquez, 2000: 362.BrionesFourzán and LozanoÁlvarez, 2002: 200.EscobarBriones and VillalobosHiriart, 2003: 101, 105.Wehrtmann and Vargas, 2003: 270.Wicksten, 2005: 85, fig. 18.Coelho et al., 2006: 50. Kemponia americanus: Bruce, 2004: 11.De Grave et al., 2006: 1422. Kemponia americana: Coelho Filho, 2006: 6. Cuapetes americanus: Okuno, 2009: 6768. Type locality. Key West, Florida, U.S.A.
Material examined. Bahía de la Ascensión, 960 specimens, May 2002; 785 specimens, Jan 2003. Bahía del Espíritu Santo, 2 985 specimens, May 2001; 404 specimens, Nov 2001. Mahahual reef lagoon, 500 specimens, Jul 1997; 381 specimens, Nov 1998. On mud and sand flats with T. testudinum, 0.51.5 m depth. Distribution. Western Atlantic Beaufort, North Carolina (Holthuis, 1951) and Bermuda (Markham and McDermott, 1980) to OneHalf Fathom Reef, southern Texas (Felder and Chaney, 1979); southwestern Gulf of Mexico, reefs of Veracruz and Campeche, and Isla Pérez, Arrecife Alacrán, Yucatán, Mexico (HernándezAguilera et al., 1996) to Sao Paulo, Brazil (Coelho and Ramos, 1972). Throughout West Indies to Trinidad and Aruba (Holthuis, 1951). Previous Mexican Caribbean records. Reported as P. americanus from: Cape Catoche (Holthuis, 1951); Isla Mujeres (Chace, 1972; CamposVázquez, 2000), Puerto Morelos (Markham et al., 1990); Isla Cozumel (Chace, 1972; BrionesFourzán and LozanoÁlvarez, 2002); Bahía de la Ascensión (Chace, 1972; Markham et al., 1990) and Bahía del Espíritu Santo (Chace, 1972); north and east of Mahahual and west central Banco Chinchorro, Quintana Roo (EscobarBriones and VillalobosHiriart, 2003). Habitat. The species inhabits sandy or rocky bottoms and macroalgae (Holthuis, 1951; CamposVázquez, 2000). On mangrove roots (Markham et al., 1990), and sponges associated with Synalpheus longicarpus (Herrick, 1891) and Synalpheus towsendi Coutière, 1909 (Wehrtmann and Vargas, 2003); shallow water to 300 m (EscobarBriones and VillalobosHiriart, 2003). Palaemon tenuicornis Say, 1818: 249. Leander tenuicornis: Holthuis, 1952: 155, pl. 41, figs. ag, pl. 42, figs. af.Chace, 1972: 19.Carvacho, 1979: 446.Markham and McDermott, 1980: 1269.RamosPorto, 1986: 13, pl.5, figs. ah, pl. 6, figs. ag.MartínezIglesias, 1986: 31, fig. 18.Markham et al., 1990: 419.Williams, 1984: 65, fig. 43.MartínezGuzmán and HernándezAguilera, 1993: 613.Jayachandran, 2001: 32.Bruce, 2002: 80.Li et al., 2004: 516, fig. 3.Cardoso, 2006: 27. Material examined. Bahía de la Ascensión, 15 specimens, May 2002; 31 specimens, Jan 2003. Bahía del Espíritu Santo, 3 specimens, May 2001; 5 specimens, Nov 2002. Mahahual reef lagoon, 140 specimens, Jul 1997; 39 specimens, Nov 1998. On fine sediments, compact sand, and mud with T. testudinum, 0.51.5 m depth. First record for Mahahual reef lagoon. Distribution. Tropical and subtropical waters of the world (Carvacho, 1979) except for the eastern Pacific region (Williams, 1984; Bruce 2002). Western Atlantic: Newfoundland, Canada (Holthuis, 1952) and Bermuda (Markham and McDermott, 1980), east of the United States; along the Gulf of Mexico to Sao Paulo, Brazil (Cardoso, 2006); Falkland Islands (Williams, 1984); along the Antilles (Holthuis, 1952; Chace, 1972); IndoWestPacific region, from the Red Sea and Reunion to Japan, New Guinea, Australia and New Zealand; east Atlantic from Mediterranean Sea to south of the Azores (Jayachandran, 2001); South China Sea (Li et al., 2004). According to Bruce (2002), the Falkland Islands record has never been verified. Previous Mexican Caribbean records. 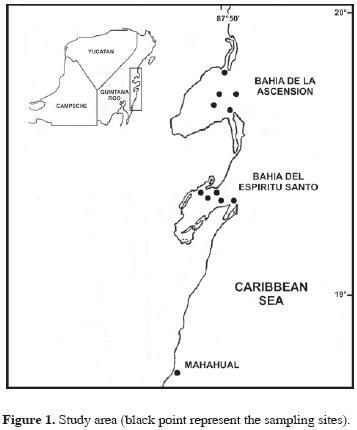 Bahía de la Ascensión and Bahía del Espíritu Santo (Chace, 1972; Markham et al., 1990). Habitat. On plants in shallow water near the seashore; open sea on floating weeds (Li et al., 2004); associated with Porites (Chace, 1972); between Thalassia on sand (MartínezGuzmán and HernándezAguilera, 1993); littoral and pelagic (Carvacho, 1979). Leander northropi Rankin, 1898: 245, pl. 30, fig. 4. Palaemon (Palaeander) northropi: Holthuis, 1952: 192 (complete synonymy), pl. 47, figs. al.Chace, 1972: 21.RománContreras, 1988: 314.AzambujaCorrea and Loyola e Silva, 1995: 218.RamosPorto and Coelho, 1998: 335. Palaemon northropi: Markham and McDermott, 1980: 1269.Abele and Kim, 1986: 14, 168, 169, figs. ab.MartínezIglesias et al., 1996: 31.Wicksten, 2005: 76, fig. 8.Coelho et al., 2006: 50. Type locality. Nassau, New Providence, Bahama Islands. Material examined. Mahahual reef lagoon, 3 specimens, Nov 1998. In beds of Thalassia and sand substrate, 0.5 m depth. First record for Mahahual reef lagoon. Distribution. Bermuda (Markham and McDermott, 1980); Florida (Abele and Kim, 1986); southwestern Gulf of Mexico, Laguna de Términos, Campeche, Mexico (RománContreras, 1988) to Piriapolis, Uruguay (Holthuis, 1952). West Indies, from Bahamas to Curaçao (Holthuis, 1952). Previous Mexican Caribbean records. Bahía de la Ascensión (Chace, 1972). Habitat. Shallow waters, sand and rocks in the vicinity of mangroves (Chace, 1972; RamosPorto and Coelho, 1998); in T. testudinum and macroalgae (RománContreras, 1988). Palaemonetes (Palaemonetes) octaviae Chace, 1972: 2224, figs. 34.Carvacho, 1979: 448.RománContreras, 1988: 314. Palaemonetes octaviae: Markham and DonathHernández, 1990: 244.Markham et al., 1990: 419.Wicksten, 2005: 77, fig. 9.Guevara et al., 2007: 989, 993. Type locality. Sandy mud flats between Ilet à Monroux and Ilet Rat, PointeàPitre, Guadeloupe. Material examined. Bahía de la Ascensión, 5 specimens, Jan 2003. In fine sand between Thalassia, 0.70 m depth. Distribution. Laguna de Términos, Campeche (RománContreras, 1988; Guevara et al., 2007) and Quintana Roo, Mexico; Guadaloupe and Leeward Islands (Chace, 1972; Carvacho, 1979). Previous Mexican Caribbean records. Bahía de la Ascensión (Chace, 1972; Markham et al., 1990). Habitat. Marine on sandy mud flats (Chace, 1972); among mangroves (Markham and DonathHernández, 1990); in less than 0.60 m depth (Chace, 1972). Periclimenaeus caraibicus Holthuis, 1951: 110113, pl. 32, figs. hj, pl. 34, figs. ah.Chace, 1972: 28.Abele and Kim, 1986: 15, 172, 173, figs. eg.MartínezGuzmán and HernándezAguilera, 1993: 613.MartínezIglesias et al., 1996: 31.EscobarBriones and VillalobosHiriart, 2003: 105.Wicksten, 2005: 90, fig. 22Coelho Filho, 2006: 6. Material examined. Bahía de la Ascensión, 2 specimens, May 2002; 2 specimens, Jan 2003. Mahahual reef lagoon, 1 specimen, Jul 1997. On sand with Thalassia, 0.41.5 m depth. First report in Mahahual reef lagoon. Distribution. Florida (Abele and Kim, 1986); Isla Pérez, Arrecife Alacrán, Yucatán (MartínezGuzmán and HernándezAguilera, 1993) to Banco Chinchorro, Quintana Roo, Mexico (EscobarBriones and VillalobosHiriart, 2003); Ceará, Brazil (Coelho Filho, 2006); in the Antilles, from Cuba (MartínezIglesias et al., 1996) to Tobago (Chace, 1972). Previous Mexican Caribbean records. Bahía de la Ascensión (Chace, 1972) and west central Banco Chinchorro, Quintana Roo, Mexico (EscobarBriones and VillalobosHiriart, 2003). Habitat. Sandy bottoms with T. testudinum (MartínezIglesias et al., 1996), near to mangrove swamp, associated with coral rocks (Chace, 1972), and among coral rubble and debris; to 260 m (EscobarBriones and VillalobosHiriart, 2003). Periclimenes rathbunae Schmitt, 1924: 70, figs. 56.Chace, 1972: 38.Criales, 1984: 310.Markham et al., 1990: 420.Spotte et al., 1991: 301, figs. 13.HernándezAguilera et al., 1996: 27.MartínezIglesias et al., 1996: 32.Wicksten 2005: 88, fig. 20. Periclimenes (Harpilius) rathbunae: Holthuis, 1951: 58, pl. 17, figs. ah. Type locality. Spanish Port, Curaçao. Material examined. Mahahual reef lagoon, 1 specimen, Nov 1998. On sandy mud with T. testudinum, 0.40.8 m depth. First record for Mahahual reef lagoon. Distribution. Dry Tortugas, Florida (Chace, 1972; Wicksten, 2005); recorded from Isla Sacrificios, Veracruz, Mexico (HernándezAguilera et al., 1996); Bahía de la Ascensión, Quintana Roo, Mexico (Chace, 1972) and Carrie Bow Cay, Belize (Spotte et al., 1991); also reported off Santa Marta, Colombia (Criales, 1984); West Indies, from Arrecife Diego Pérez, Gulf of Batabanó, Cuba (MartínezIglesias et al., 1996) and Pine Cay, Caicos Bank, Turks and Caicos Islands (Spotte et al., 1991) to Tobago (Chace, 1972) and Curaçao (Holthuis, 1951). Previous Mexican Caribbean records. Halfmoon Bay, near Akumal (Wicksten, 2005) and Bahía de la Ascensión (Chace, 1972). Habitat. Associated with sea anemones in shallow waters (Spotte et al., 1991); Chace (1972) reported this species in dead coral and rocks in sandy beaches; collected to a depth of 15 m (Criales, 1984). Periclimenes siankaanensis MartínezMayén and RománContreras, 2006: 3342, figs. 13. Typelocality. Cayo Culebras, Bahía de la Ascensión, Quintana Roo, Mexico. Material examined. Bahía de la Ascensión, 3 629 specimens, May 2002; 1 049 specimens, Jan 2003. Bahía del Espíritu Santo, 2 664 specimens, May 2004; 194 specimens, Nov 2001. Mahahual reef lagoon, 1 specimen, Jul 1997; 1 specimen, Nov 1998. First record for Mahahual reef lagoon. Distribution. Bahía de la Ascensión and Bahía del Espíritu Santo, Mexican Caribbean coast. Habitat. Very abundant in T. testudinum seagrass meadows on sandy bottoms, in less than 1 m of depth (MartínezMayén and RománContreras, 2006). Palaemonella Yucatanica Ives, 1891: 183184, pl. 5, fig. 8. Periclimenes (Periclimenes) yucatanicus Holthuis, 1951: 38, pl 10, figs. al.Limbaugh et al., 1961: 240, fig. 2. Periclimenes yucatanicus: Chace, 1972: 38.Rodríguez, 1980: 88, fig. 26.Criales, 1984: 310.RománContreras, 1988: 314.Markham et al., 1990: 420.Spotte et al., 1991: 309.MartínezIglesias et al., 1996: 32.BrionesFourzán and LozanoÁlvarez, 2002: 200.Wicksten, 2005: 83, fig. 16, pl. 3, fig. B.Coelho et al., 2006: 50. Type locality. Off Progreso, Yucatán. Material examined. Bahía de la Ascensión, 1 specimen, Jan 2003. Sandy mud substrate with Syringodium and Thalassia, 1 m depth. First record for Bahía de la Ascensión. Distribution. Cape Florida, Dade Co., S. E. Florida (Holthuis, 1951); in southwestern Gulf of Mexico, from Laguna de Términos, Campeche (RománContreras, 1988) and Progreso, Yucatán, Mexico (Ives, 1891). Southward to Bahía, Brazil (RamosPorto and Coelho, 1998). West Indies from Bahamas (Limbaugh et al., 1961) to Antigua Island (Chace, 1972). Previous Mexican Caribbean records. Isla Cozumel (Chace, 1972; Markham et al., 1990) and Chankaanab Park, on the same island (BrionesFourzán and LozanoÁlvarez, 2002); Akumal, Quintana Roo (Wicksten, 2005). Habitat. Commonly associated with sea anemones (Spotte et al., 1991) and the benthic medusa Cassiopea xamachana Bigelow (Criales, 1984); to a maximum depth of 20 m (MartínezIglesias et al., 1996). Typton carneus Holthuis, 1951: 162165 (in part), pl. 51, figs. a, e, k, l.Chace, 1972: 4649 (emended description), fig. 12.Felder and Chaney, 1979: 24.Abele and Kim, 1986: 17, 186, 187, figs. fh.RamosPorto and Coelho, 1998: 340.GarcíaMadrigal et al., 2002: 145.Coelho et al., 2006: 50. Material examined. Bahía de la Ascensión, 1 specimen, Jan 2003. In sandrocky bottom with T. testudinum, shallow water at less than 1 m.
Distribution. South and west coasts of Florida (Holthuis, 1951) and Seven and OneHalf Fathom Reef, southern Texas (Felder and Chaney, 1979); Paraíba, Brazil (RamosPorto and Coelho, 1998). West Indies from Bahamas to Tobago (Chace, 1972). Previous Mexican Caribbean records. Listed by GarcíaMadrigal et al. (2002) (unspecified locality). Habitat. Holthuis (1951) reported this species in coarse gray sand and broken shells in depths of ca 20 to 73 m. Species of the genus Typton commonly are found in sponges and corals (Chace, 1972). Urocaris longicaudata Stimpson, 1860: 39.Rathbun, 1902: 126.Bruce, 2007a: 6166, figs. 13. Periclimenes (Periclimenes) longicaudatus Holthuis, 1951: 26, pl. 6, figs. am, pl. 8, fig. m.Nizinski, 2003: 104. Periclimenes longicaudatus: Chace, 1972: 37.Coelho and Ramos, 1972: 147.Carvacho, 1979: 453.Williams, 1984: 86, fig. 58.MartínezIglesias, 1986: 32, fig. 19A.HernándezAguilera et al., 1996: 27.Arrivillaga and Baltz, 1999: 307.GarcíaMadrigal et al., 2002: 145.Barba et al., 2005: 715.Wicksten, 2005: 84, fig. 17. Type locality. Coast of Carolina (unspecified site). Material examined. Bahía de la Ascensión, 43 specimens, May 2002; 4 specimens, Jan 2003. Mahahual reef lagoon, 61 specimens, Jul 1997; 4 specimens, Nov 1998. Collected in sand and mud with Thalassia, 051.5 m depth. First record for both localities. Distribution. Cape Hatteras, North Carolina (Williams, 1984) to near the Brazos Santiago Pass jetty at South Padre Island, Texas (Wicksten, 2005); southwestern Gulf of Mexico from Campeche, Mexico (HernándezAguilera et al., 1996; Barba et al., 2005) to Sao Paulo, Brazil (Coelho and Ramos, 1972); West Indies from Bahamas Islands (Andros Bank) to Trinidad (Holthuis, 1951). Previous Mexican Caribbean records. The species was listed by GarcíaMadrigal et al. (2002) as P. longicaudatus for the Mexican Caribbean, but the collecting site was not specified. Habitat. Abundant on seagrass beds of Sargassum, Leptogira and T. testudinum (Williams, 1984; Arrivillaga and Baltz, 1999), in sponges (Holthuis, 1951) and coral Porites (Chace, 1972); shallow waters to ca 27 m (Holthuis, 1951). Remarks. Recently the genus Urocaris Stimpson, 1860 was resurrected by Bruce (2007a) being the type species Urocaris longicaudata. Analyzed species represent 41.6% of the marine palemonid shrimps reported for shallow waters of the Caribbean coast of Quintana Roo (24 species) (Chace, 1972; Markham and DonathHernández, 1990; Markham et al., 1990; BrionesFourzán and LozanoÁlvarez, 2002; GarcíaMadrigal et al., 2002; MartínezMayén and RománContreras, 2006). This percentage is relatively high considering that sampling was carried out only in seagrass meadows. Although Periclimenes was the most diverse genus, only P. siankaanensis was very abundant. This could be because it is a conspicuous inhabitant of the T. testudinum beds (MartínezMayén and RománContreras, 2006), whereas the majority of the other species are associated a wide variety of invertebrate hosts (Bruce, 2007b) as P. rathbunae and P. yucatanicus both reported living on anemones (Spotte et al., 1991). According to Bruce (2008), the anemones are commonly found amongst seagrass beds being probable that the collecting activities detach the shrimps from their hosts. This would explain the presence and low abundance of these species in our samples. Bauer (1985) reported that Cuapetes americanus (mentioned as Periclimenes americanus) is abundant in seagrass beds, which is confirmed in the present study, being the species with the second greatest number of organisms only after P. siankaanensis (Table 1). The reason for other pontoniine species such as Typton carneus presenting low abundance, is probably due to the species constitutes part of the cryptofauna and is better represented in coral rocks and cavities of sponges (Chace, 1972), which were not sampled in this study. All crustaceans collected belong to the Caribbean province, which extends from the mouth of the Orinoco River to Cabo Rojo, Gulf of Mexico (21°36N'), the Caribbean Islands and southern of Florida, from Cape Romano (25°54'N) in the Gulf of Mexico to Cape Canaveral in the Atlantic Ocean (Boschi, 2000; Briggs, 1974). In this zone, water temperature ranges from 20° to 25°C in winter, and 28° and 30°C in summer (Boschi, 2000). The strongest affinity of the palaemonid fauna treated here, besides that to the Caribbean region, was with the Brazilian region (70%) and in a lesser degree with the Argentinian (40%), Texan (40%), Carolinian (30%), Virginian (10%), and Boreal (10%) zoogeographic provinces (Boschi, 2000). On the other hand, L. tenuicornis, C. americanus, and U. longicaudata have wider distributional range with respect to the other species; whereas Palaemonetes (P.) octaviae, Periclimenes rathbunae, and P. siankaanensis are limited only to the Caribbean province, and should be considered endemic for this region. The distribution of decapods has been associated with different ecological features such as productivity, habitat, physiological tolerance of the species (Gorny, 1999), as well as marine currents (Lemaitre and AlvarezLeón, 1992). However, according to Boschi and Gavio (2005), temperature is the main factor determining the distribution of crustaceans. Species considered to be tropical live in marine waters with a temperature of 20°C or more for much of the year (Wicksten and Hernández, 2000). In this case, the carcinological fauna of Quintana Roo has a tropical affinity (Markham et al., 1990), which explains that the greater concentration of species, besides the Caribbean, is distributed in the Brazilian zoogeographic province, where the temperature fluctuates from 22° to 30°C (Boschi, 2000). The same author suggested that both tropical and subtropical species decrease in number towards the temperate and cold regions, explaining why the palaemonid shrimp reported in this study have less affinity with more temperate zoogeographic provinces. It is necessary to carry out a more detailed systematic study of the crustacean fauna of the area in order to preserve its diversity and the protection of the different substrata from the marine zone (BrionesFourzán and LozanoÁlvarez, 2002), where the urban and tourist activities (CastellanosOsorio and SuárezMorales, 1997) alters and degrades the habitat and modify the marine biota. Thanks to A. Reda Deara (Estación El CarmenICMyL) for his help in the field; to J. Romero Rodríguez, M. A. Carballido Carranza, A. Sánchez Quiñones and V. Vega González for their help analyzing partially the biological material; as well as to the Dirección General de Vida Silvestre de la SEMARNAP, to staff of the Reserva de la Biosfera de Sian Ka'an for the facilities granted during field work; and to the anonymous referees for their comments on the manuscript. Ledoyer, M. 1986. Faune mobile des herbiers de phanérogames marines (Halodule et Thalassia) de la laguna de Términos (Mexique, Campéche) I. Les Caridea (Crustacea Decapoda).